Once the country residence of a Scottish lord, Dalmahoy has come a long way since 1725 – today a luxury 4-star hotel and golf resort that seamlessly blends its baronial tradition with contemporary creature comforts and two splendid 18-hole courses, both designed by the legendary James Braid. Inside, the hotel’s elegant James Braid bar celebrates Scotland’s golfing hero. 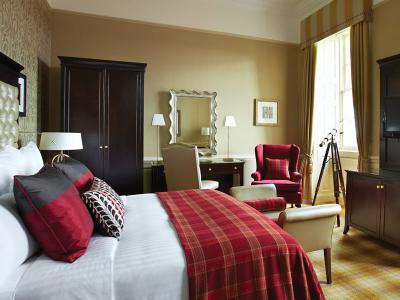 As you enter the Dalmahoy Hotel and Country Club, you’ll notice its period detailing and traditional décor – tartan wingbacks, Chesterfields, wood panelling and warm lighting make for a rich, timeless sense of luxury. 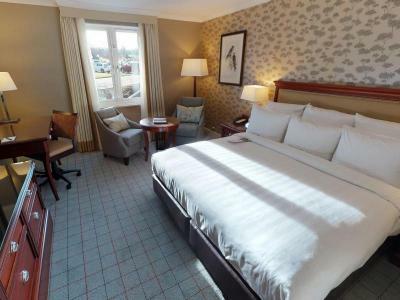 Nestled at the foot of the Pentland Hills, Dalmahoy enjoys peace and a prime position – close to the M8 and the airport, with Edinburgh city centre just 7 miles away. Some of Scotland’s finest attractions are at its doorstep – the medieval Rosslyn Chapel; Livingston, the country’s largest designer outlet; and Deep Sea World, its national aquarium. When you’re not perfecting your swing on the driving range, sightseeing, or hitting the shops, you may want to take a lap of the pool, workout, or be pampered in the Beauty Essentials salon. 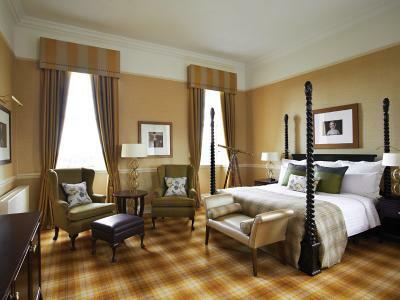 There are 215 individually designed rooms at Dalmahoy Hotel. 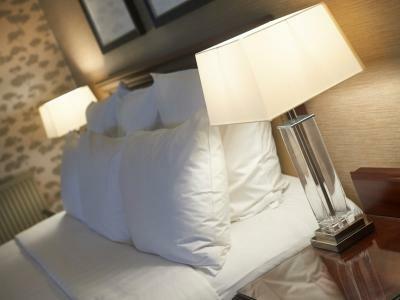 All come fully equipped with free Wi-Fi, Samsung 49-inch Smart TVs (SkySports, TVCatchup, Bluetooth, HDMI, USB), work and seating areas, Hypnos beds, and luxury amenities. 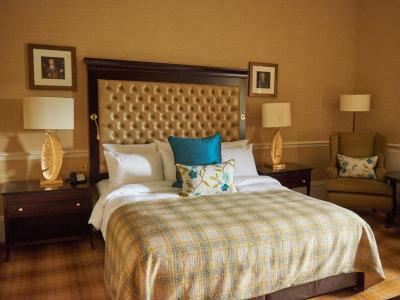 Rooms range from comfortable deluxes, to traditional, tartan-accented turret suites, housed in the corner turrets of the 18th Century baronial manor with panoramic views over the championship-standard golf course. Room service is available. Wake up inspired. Wake up with Classic British Hotels. We say: These handsomely appointed rooms are perfectly formed with both an easy chair and a work desk: Contemporary style en suite bedroom, 172-226sqf, offering free Wi-Fi, Smart TV, digital radio, mini fridge, safe, writing desk, 2 direct dial phones, alarm clock, ironing station, tea and coffee making facilities, mineral water (charge), toiletries, and hairdryer. Queen-sized bed. Accessible? There is one full accessible room with 32-inch-wide opening, grab rails, pull cords, a low-lip bath and a wet room with roll-in shower. Full accessible and part accessible (without a wet room) rooms are located on the ground floor. Cribs/rollaway beds permitted: 2. We say: These rooms have 2 double beds, making them ideal for groups and families: Contemporary style en suite bedroom, 172-226sqf, offering free Wi-Fi, Smart TV, digital radio, mini fridge, safe, writing desk, 2 direct dial phones, alarm clock, ironing station, tea and coffee making facilities, mineral water (charge), toiletries, and hairdryer. 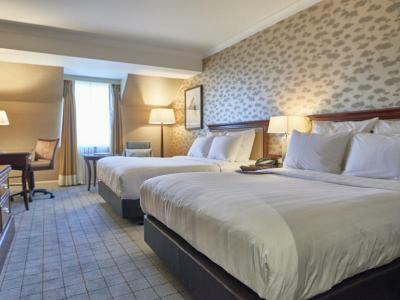 Two double beds. Accessible? These rooms are split between the 1st and 2nd floors, which are accessible by lift. Bath and shower combined. 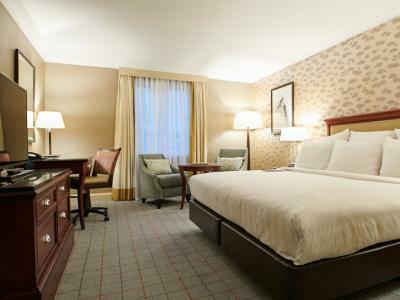 Interconnecting rooms are available. 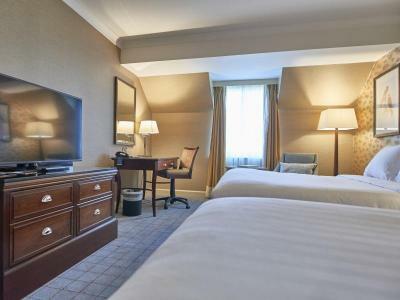 Child policy: Up to 2 children aged 12 years and under stay free and enjoy a free breakfast (excludes Room Only rates) when accompanied by a full paying adult. When the accompanying adult(s) has a main course for dinner, up to 2 children can dine free when ordering from the children's menu. If a child wishes to dine from the à la carte menu, this will be charged at 50% of the menu price (excludes steaks). We say: Deluxe kings are appointed to a higher standard than classic rooms and feature a sitting area: Contemporary style en suite bedroom, 172-226sqf, offering free Wi-Fi, Smart TV, digital radio, mini fridge, safe, writing desk, 2 direct dial phones, alarm clock, ironing station, tea and coffee making facilities, mineral water, bathrobes, slippers, toiletries, and hairdryer. King-sized bed. Accessible? These rooms are split between the 1st and 2nd floors, which are accessible by lift. Bath and shower combined. Cribs/rollaway beds permitted: 2. We say: These beautifully designed period rooms are appointed to a very high standard and feature dedicated sitting areas: Period style en suite bedroom offering free Wi-Fi, Smart TV, digital radio, mini fridge, safe, writing desk, 2 direct dial phones, alarm clock, ironing station, Espresso coffee machine, mineral water, newspaper (on request), bathrobes, slippers, toiletries, and hairdryer. King-sized bed. Accessible? These rooms are located on the 2nd floor of the main house. There is no lift to main house rooms. Bath and shower combined. Cribs/rollaway beds permitted: 2. We say: These beautifully designed period suites are appointed to a very high standard and feature dedicated sitting areas: Period style suite offering free Wi-Fi, Smart TV, digital radio, mini fridge, safe, writing desk, 2 direct dial phones, alarm clock, ironing station, Espresso coffee machine, mineral water, newspaper (on request), bathrobes, slippers, toiletries, and hairdryer. Four-poster bed. Accessible? These suites are located on the 2nd floor of the main house. There is no lift to main house rooms. Separate bath and shower. Cribs/rollaway beds permitted: 2. We say: These large one-bedroom corner suites enjoy a substantial sitting area and panoramic golf course views. En suite bathrooms have a separate bath and shower: Contemporary style suite offering free Wi-Fi, Smart TV, digital radio, mini fridge, safe, writing desk, 2 direct dial phones, alarm clock, ironing station, Espresso coffee machine, mineral water, newspaper (on request), bathrobes, slippers, toiletries, and hairdryer. Super-king-sized bed. Accessible? These suites are split between the 1st and 2nd floors, which are accessible by lift. Separate bath and shower. Cribs/rollaway beds permitted: 2. We say: These two-bedroom, two-bathroom suites feature a substantial sitting area and country views. En suite bathrooms have a separate bath and shower: Contemporary style suite offering free Wi-Fi, 2 Smart TVs, digital radio, mini fridge, safe, writing desk, 3 direct dial phones, alarm clock, ironing station, Espresso coffee machine, mineral water, newspaper (on request), bathrobes, slippers, toiletries, and hairdryer. Room 1: Super-king-sized bed. Room 2: Two queen-sized beds. Accessible? These suites are split between the 1st and 2nd floors, which are accessible by lift. Separate bath and shower. Cribs/rollaway beds permitted: 2. Child policy: Up to 2 children aged 12 years and under stay free and enjoy a free breakfast (excludes Room Only rates) when accompanied by a full paying adult. When the accompanying adult(s) has a main course for dinner, up to 2 children can dine free when ordering from the children's menu. If a child wishes to dine from the à la carte menu, this will be charged at 50% of the menu price (excludes steaks). We say: This one-of-a-kind one-bedroom suite offers the ultimate in Lothian luxury and features two en suite bathrooms, a study area, a separate living room with sofa bed, and country views: Contemporary style suite offering free Wi-Fi, 2 Smart TVs, digital radio, mini fridge, safe, writing desk, 2 direct dial phones, alarm clock, ironing station, Espresso coffee machine, mineral water, newspaper (on request), bathrobes, slippers, toiletries, and hairdryer. King-sized bed. Accessible? This room is on the 2nd floor of the main house. There is no lift to main house rooms. Separate bath and shower. Cribs/rollaway beds permitted: 2. Child policy: Up to 2 children aged 12 years and under stay free and enjoy a free breakfast (excludes Room Only rates) when accompanied by a full paying adult. When the accompanying adult(s) has a main course for dinner, up to 2 children can dine free when ordering from the children's menu. If a child wishes to dine from the à la carte menu, this will be charged at 50% of the menu price (excludes steaks). After leaving the airport, turn left onto the A8 towards Edinburgh. Take the exit for the City Bypass South (A720) and follow it until you see the sign for the A71 road towards Kilmarnock, East Calder and Livingston. Take this exit and then take the A71 at the Calder Junction. Approximately 3 miles along the A71 turn left into the Hotel driveway. After leaving the airport, turn right on to the A8 and head towards the Newbridge roundabout. Keep to the inside lane which is marked B7030 on the road. Take the B7030 to Wilkieston. At the traffic lights in Wilkieston turn left on to the A71 heading towards Edinburgh. Stay on the A71 for approximately 1.5 miles then turn right into the Hotel driveway. Take junction 3 on the M8 through Livingston. Follow signs to Edinburgh on A71. The Dalmahoy Hotel is situated on the right approximately 2 miles past the small village of Wilkieston. The Dalmahoy Hotel's flagship restaurant offers mouth-watering Scottish cuisine in elegantly furnished surrounds. Commanding superb views over the 18th hole of the East golf course and the lake, with Edinburgh Castle in the background, guests can soak up the scenery whilst enjoying fine Scottish fayre, such as Scottish smoked haddock with Scottish mussels to start; local lamb rump crusted with herbs and almonds for a main; and a selection of Scottish cheeses served up with onion and plum chutney to top it off. Tender steaks are available from the grill. Plus, freshly picked herbs from the hotel's estate, and honey collected from its beehives, help to keep the food miles down and add local Lothian flavours. Natural daylight floods through huge picture windows. Views over the beautifully maintained parkland estate remind you that you're staying at Edinburgh's secret country retreat. Grab a spot of lunch in this bright and airy bistro-style eatery; options range from grilled meats, burgers, chargrilled pizzas and pasta, to snacks, shareables and delectable desserts. In the summer, dining at the Dalmahoy Hotel reveals an altogether different flavour. Take a seat in the fresh open air – sunny or shade – and dine al fresco. A thousand acres of countryside lie at your disposal. With French doors opening onto the parkland estate, the Pentland Restaurant offers guests delicious Scottish dining and superb golf course views. After exploring Edinburgh or the Scottish countryside on foot, find your perfect spot to wile away an hour or two. Don’t miss the opportunity to indulge in afternoon tea whilst staying in this glorious setting - savour homemade scones with fruit preserve and cream, sandwiches, cakes and a pot of tea. Both traditional afternoon tea and champagne afternoon tea are available to order and can be enjoyed in the cocktail and whiskey bar – sitting comfortably by the roaring open fire - or on the terrace, overlooking the 18th hole of the East golf course. Afternoon tea can be booked in advance, at a special price, when booking your room via ClassicBritishHotels.com. 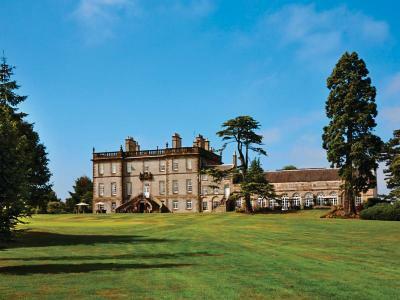 The unique surroundings of Dalmahoy Hotel present a wonderful setting for private dinners and celebrations. The hotel caters for reunions, anniversaries, family gatherings, birthday parties, charity and club events, and business dinners. 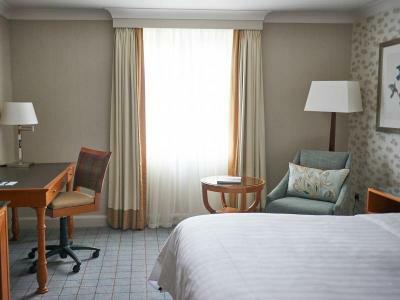 Choose from a range of private rooms, each with its own individual character. Call Classic British Hotels on 0844 967 0984 for advice and let us help you organise a memorable private dinner. Dalmahoy Hotel's health club features an 18-metre heated indoor pool (31 degrees) with an integrated spa pool, and a poolside sauna and steam room. The gym is equipped with Star Trac cardiovascular equipment - fitted with TV screens, iPod stations and personal fans - and Technogym resistance machines, plus a selection of free weights. A dance studio offers over 30 classes per week including Pilates, yoga, Zumba, body combat and spinning. You can also make use of the all-weather, floodlit tennis courts. The Beauty Essentials salon provides a full therapy menu, including nail services, tanning, massages, waxing, facials, Pulsar IPL, and eyelash extensions. A full range of spa treatments, using Clarins and Jessica products, are available to book. Host to major amateur and professional tournaments over the years, including the Solheim Cup and the Charles Church Seniors PGA Championship of Scotland, Dalmahoy is widely considered one of the country's great golfing destinations. Set at the foot of the Pentland Hills, Dalmahoy Hotel's 1,000-acre country estate lends itself to stunning, uninterrupted woodland views and superb golfing facilities, including a 12-bay floodlit driving range and a 9-hole putting green. James Braid - one of the leading golfers of his generation; he won the prestigious Open Championship an impressive five times - designed both of Dalmahoy's 18-hole courses - East and West. With undulating greens and bunkers, they have been designed to offer different challenges for the keen golfer and make for an enjoyable golf break just outside of Edinburgh. Designed and built by James Braid in 1927, the East course has since been extended and redeveloped to test even the best of players. The 18-hole course's long sweeping fairways and generous greens, protected by strategic bunkers, offer a championship-standard golfing experience. Long par 4 holes provide a real challenge and the signature 18th hole has the green set in front of the baronial country mansion with a testing approach over a wide ravine. The shorter West course offers a very different game to its sister course. With tighter fairways and smaller greens, more accuracy is required from the tee. The finishing holes cross the Gogar Burn - a tributary of the River Almond - meandering through the fairway. The national aquarium of Scotland. At Deep Sea World, you can take a tour of themed underwater zones on a sub-aquatic safari. Home to one of the longest underwater tunnels in the world (112 metres), Deep Sea World allows you to get up close and personal to one of the largest collection of sharks in Europe, including Sand Tiger sharks. Other highlights include the seal enclosure, the Amazon rainforest and piranha exhibits, the beautiful Lake Malawi display, and a collection of amphibians. There are daily talks and feeds, shark encounters and dives. Love great brands but dislike high-street prices? Scotland's largest designer outlet, Livingston, is less than 5 miles from Kirknewton. With over 70 boutiques selling brands at up to 60% off everyday prices there is something to suit every taste. Iconic fashion labels include Fred Perry, Kurt Geiger, Lacoste and Tommy Hilfiger. There are athletic labels like Nike and Adidas, and high-street favourites like M&S and Next. Just outside of Edinburgh, and surrounded by 1,000 undulating acres of lush parkland, at the Dalmahoy Hotel and Country Club you enjoy unrivalled facilities - impeccably appointed rooms and suites; traditional Scottish fine dining; relaxed bistro-style dining; championship golf; spa treatments; a health club; and a business centre featuring 11 event rooms, 9 breakout rooms and an on-site exhibition space – that's 1,091 square metres of total event space. 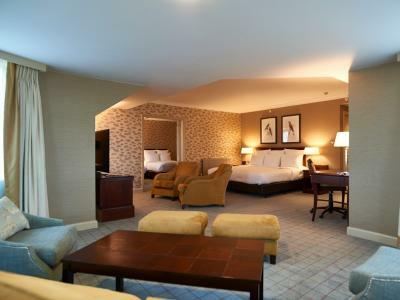 The Dalmahoy suite can accommodate up to 300 guests. 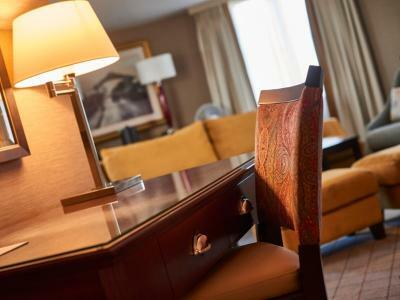 There is state-of-the-art AV; computer stations; free, enhanced, high-speed Wi-Fi; and plenty of on-site parking, complimentary of course. 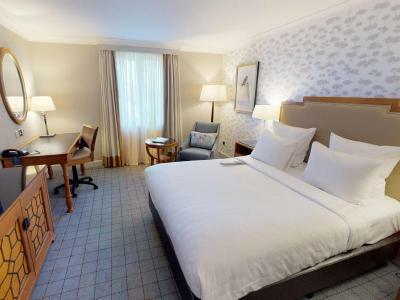 Seven miles west of Edinburgh city centre (on the A71) and just three miles from Edinburgh International Airport, you are at the doorstep of the country's major road, rail and air transport links. 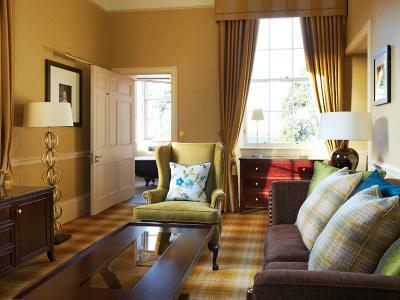 Edinburgh's secret country house retreat is awaiting your arrival.